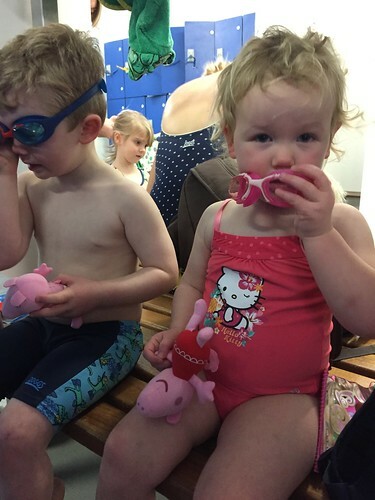 Our children swim like fishes these days. We took them to the local swimming pool and they were happily bobbing about in the children’s pool so we went to the big pool. The Little Miss happily wades in and doggy paddles her way across the edge of the pool. 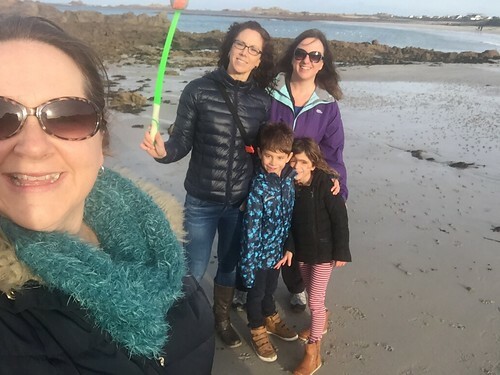 Went out for a walk with my sister, her friend and all the children and we wandered around the headland at Choet, around the tip and back to the beach for a quick cuppa looking at the sea. It was seriously mild today and felt like it could be Spring. Gorgeous. Today I went to buy some wool suitable for crochet as I was given a couple of ‘how to’ books for Christmas. When we got home The Little Miss disappeared off into her room and shut the door, I should have known she was up to no good then! When I went in she had taken off all of the labels of all of the balls of wool and she had completely unravelled two of them into a heap on the floor. 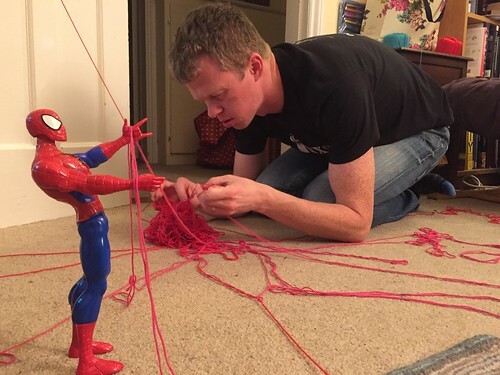 This is true love, my lovely husband (ably assisted by Spiderman) unravelling the naughty Little Miss’s handiwork! Today we took the kids to the local am-dram panto. 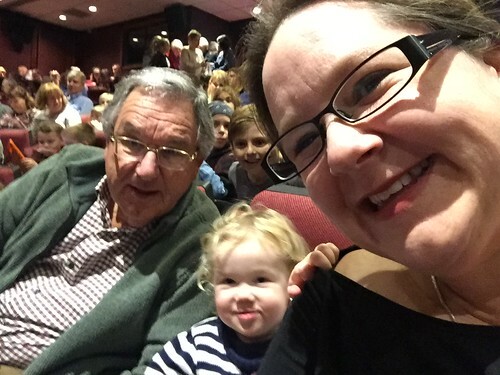 My niece and nephew really enjoyed it, my sister and brother-in-law hated it (not their thing at all) and every time the pantomime dame came on stage The Little Miss cried and kept saying ‘No like that lady’. Another fab day. First thing this morning we all wandered down to Cobo beach to watch the hundreds of people brave the biting wind to go in for the charity swim. Apparently the water wasn’t too bad but the wind made it feel really chilly. 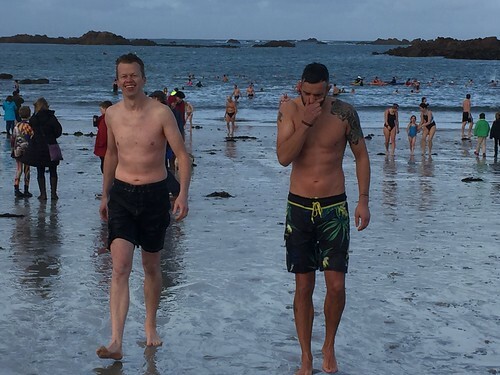 My husband and brother-in-law went in three times – the fools! This evening we met up with my Dad’s side of the family. We had a fab evening of heaps of food and time to catch up. The Little Miss was an expert at working the room and really entertained all the aunts and uncles. The Little Mister spend the evening roaring about with his cousins and my cousins kids. They are both shattered but it has been lovely. We have had a lovely day. This morning we had a leisurely morning opening presents and chilling out at home before heading to my Dad’s where my sister and I cooked lunch. I have to say it, but it was a really good Christmas dinner to be honest – Mum would have been proud! Before opening presents we went for a quick tramp across the beach. 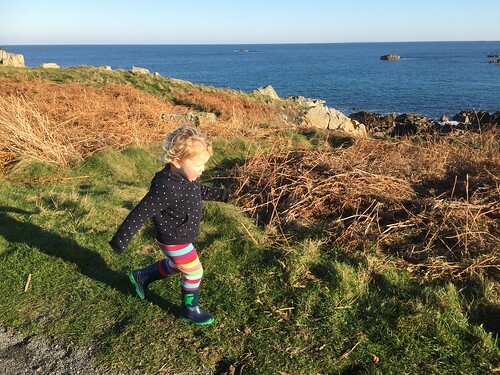 We had a lovely day together but decided to head home when the children were starting to lose it because they were so tired. Sometimes you have to cut your losses! I am so proud of my lovely family. Together we are strong and today is one of those days that we always think of Mum. This is our fourth Christmas without her and it doesn’t get any easier, I think somehow we just get better at doing all the stuff she used to do for us. So, Happy Christmas to all our wonderful friends and family. Thank you for being a huge support over the year – I cou;dn’t manage without you all. 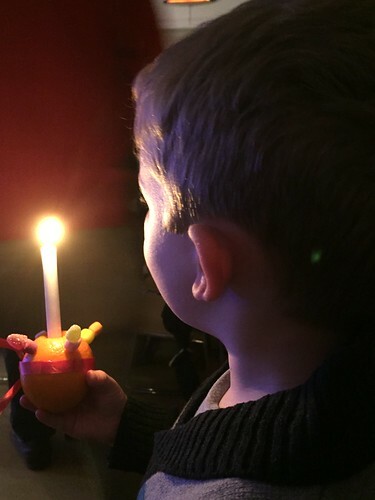 This evening The Mister and I took the children to the Christingle Service at church this evening. Without a doubt Christingle is one of the strangest services in the church calendar. 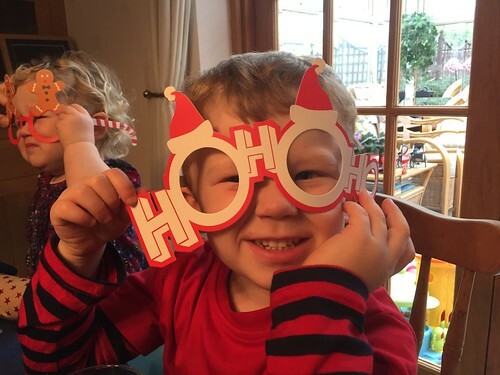 The Little Mister really enjoyed it this year and in fact his understanding about Father Christmas and ‘being good’ has really developed this year. I am also loving hearing him talk about The Nativity and Jesus and how the donkeys went to visit him etc. Sometimes it is like a random stream of consciousness but in the middle of it all there are some little gems. He is truly wonderful to be around at the moment! So, this evening we reflected on the coming of Jesus, the Light of the World. I hope and pray that everyone has a wonderful and peaceful Christmas. I have had the most brilliant birthday today – I think I enjoyed it even more than the big 4-0 last year maybe it was less of a big deal so it just felt lovely. It has been the most beautiful day so this morning I walked to the beach and met my sister and cousin and the kids down there. We spend a good couple of hours walking the dog and the kids spent ages playing on the sand and jumping and rolling around. We then met my Dad for lunch at the local pub. This evening The Mister and I went on the bus into town with my cousin Beccy and he husband Pierre to see my cousins band Clameur de Haro play. It was a fab night out and we even experienced the entertainment of the night bus home. Thankyou for all your gifts, cards and best wishes. It has been a fabulous day! This evening my sister and I went to do the food shopping for Christmas day and some stuff for Boxing Day…. well we have already done a an order for M&S so this was just the rest… it was a very expensive rest! We took it down to Dad’s house and he was told he had to sort out the drinks for the day. It would seem that he has done that. 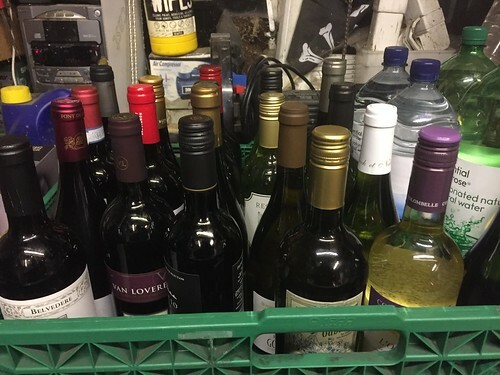 The wine cellar garage is stocked and we are ready to go! 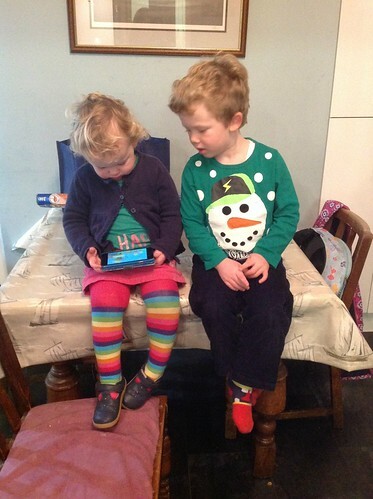 I wondered why the children had been really quiet and when I went back into the kitchen I found the pair of them sitting on the table watching Peppa Pig on my phone. Sometimes the electronic babysitter is a wonderful thing!